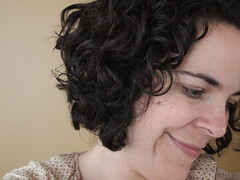 I’m still terribly behind updating my blog but, to be fair, I’m terribly behind on everything right now, including laundry, thank-you notes (they’re coming, I swear) and, well, my hair. Up until yesterday, I had not had a haircut since early March—before we moved, before the boys were born, before I was put on bed rest. For some women, four months between haircuts isn’t uncommon. But I have big hair. And when I don’t get it cut, I have really big hair. So yesterday I took advantage of the fact that Andy had had some child-free time the night before with friends to have some of my own child-free time and I headed out to Pump Salon for a much-needed cut and color. Never before have I had a more embarrassing haircut. Thankfully, Nicholena, who cuts my hair, recently had a second child of her own and was more than understanding. 1. As Nicholena applied color to my hair she found not one, not two, but three (three!) I-kid-you-not dreadlocks in my hair. Now, to be fair, you should know that I have curly hair. I can’t brush it. If I were to brush it, it would be huge. Instead I wash, condition and run my fingers through it. Styling involves several handfuls of mousse and a ridiculous amount of Frizz-Ease hairspray. I never blow dry. So the fact that I had three small sections of terribly tangled hair isn’t all that unreasonable. But still, I was mortified. Lately, showers have been hard to come by. And when I do shower, I throw on clothes and then tend to whomever needs tended to while my hair starts frizzing and getting bigger and bigger, drying without product. Not wanting to live with a huge head of hair all day I usually find time to take a 30-second break to apply mousse and hairspray. Throughout the next few days I haphazardly place bobby pins to hold curls that pop loose. And then, eventually, I find 10 minutes to shower again. Nicholena was awesome. She acted like she finds dreadlocks in curly hair all the time (I’m sure she doesn’t). And she painstakingly combed each one out. I’m thankful she didn’t have to cut them out. 2. Once the color was applied I got to sit on a comfy chair with my feet propped up on an ottoman. I flipped through Glamour, Cincinnati Magazine and Allure. And then I fell asleep. Minutes (seconds?) later I woke up to find the back of my right hand covered in hair dye. Apparently I was propping my head on my hand and my head, in my sleep-deprived-nap state, slipped. I’m looking at the stain on my hand as I type this. Yes, it probably would come out if I showered but remember, I don’t have time to shower. 3. As Nicholena washed the dye out of my hair I felt her pulling. And pulling. And pulling. Pulling ridiculous amounts of hair. Out. Of. My. Head. Apparently postpartum hair loss is normal. And thankfully, I have a lot of hair so losing a lot doesn’t do much. Yet it’s still quite embarrassing to see your hairdresser clutching fistfuls of your hair. Nicholena reminded me over and over that it’s normal but did admit she was amazed. Sorry, Andy. I’m sure there’s going to be some shower drain unclogging in your future. I love the cut and color. As well as the expensive deep-conditioning shampoo and conditioner I bought in an attempt to keep the whole dreadlock thing from ever happening again. And I have to believe (or at least hope) I’m not the first new mom any of this has happened to. And, I suppose, in a not so pleasant way the experience did remind me that even though things are crazy busy for me right now it’s OK and good and necessary to take time for me or else, I expect, more than my hair will end up in tangles. This entry was written by kara, posted on July 25, 2010 at 11:13 pm, filed under Uncategorized and tagged hair, motherhood, time. Bookmark the permalink. Follow any comments here with the RSS feed for this post. Post a comment or leave a trackback: Trackback URL.